The University of Central Florida Information Literacy Modules are instructional resources that faculty can integrate into their courses to help students learn information literacy skills. As students complete modules representing their mastery of essential info lit skills, they automatically earn badges which they can store, manage and share in their Credly account. Digital badges are awarded to students for completion of any of UCF’s Information Literacy Modules. Students earn a digital badge when they score 80% or higher on a module quiz. An email is automatically sent to each student acknowledging their accomplishment and providing a link to claim their badge. Badges are awarded for successful completion of each of UCF’s Information Literacy Modules. The individual modules are grouped into three functional categories: Gather, Evaluate, and Use. Students who successfully complete all of the modules in one of the categories are awarded a secondary badge validating their competency in this functional area. Students who earn all three of the secondary badges (Gather, Evaluate, and Use) are awarded a culminating, high-level badge recognizing mastery of foundational information literacy skills and knowledge required within UCF’s academic context. Students may choose to make some or all of their badges viewable publicly via Credly. 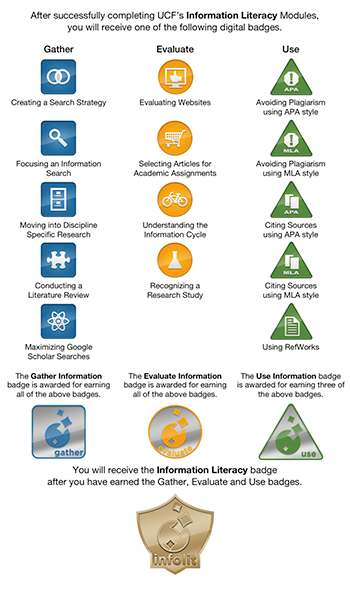 Badges are an alternative form of credentialing popular in informal learning contexts, while some academic institutions have begun to deploy badges within courses/programs as well. Demonstration of specified learning outcomes is represented visually by a “badge,” a digital image displayed on a website accompanied by written information detailing the accomplishment and criteria for earning the badge.